Lucky Bamboo brings good fortune. Lucky 7 Bamboo Arrangement. Our Lucky 7 Bamboo arrangement comes with 2 spiraling stalks that evoke power. It's a simple and elegant combination, ideal for those searching for a minimalist elegance. Legend says a gift of living bamboo brings good fortune, hence the name "Lucky Bamboo". The 7 stalks are approximately 16-18" tall. A combination of curved and straight bamboo in an Asian red glazed container is tied together with a lucky gold band. Stone pebbles and care information included. A thriving Dracaena (bamboo) symbolizes good fortune in many Asian countries. Care tips: Simply place the stems in the container with the stone pebbles and add fresh water. Replenish water weekly. 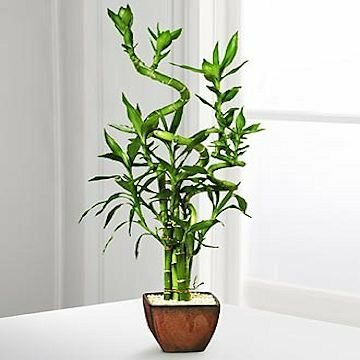 Bamboo will thrive in either low light or indirect sunlight.